I was driving down New Jersey Avenue yesterday around lunch, lost in thought, stopped at the light right before 395, when a disheveled man tapped on the window glass. I was expecting it to be one of the panhandlers that usually frequents that block, but I was surprised to find instead a man in a white wifebeater undershirt with a hastily stenciled message about the end of the world on May 21st. The green light saved me from response and I drove onward. 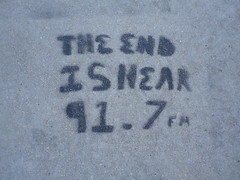 The group is part of the Family Radio Network, a Christian fundamentalist radio network lead by Harold Camping, who set the date for the end of the world on May 21st, 2011. The Post has a detailed story, including a hysterical anecdote from a person employed by the Department of Homeland Security who has taken a leave of absence until the 23rd of May. You may see these folks on the street corners here in DC for the next week or two, but let ‘em just be. I suspect they’ll be pretty disappointed come 6:01pm on May 21st, when the world hasn’t ended. That’s punishment enough. Though, a friend tweeted yesterday, if they’re right, at least we won’t have to deal with them constantly reminding us they had it pegged. are many, MANY Christians who believe that a “Rapture” is indeed going to eventually occur, and that at some unknowable date millions of people all over the Earth are going to vanish into thin air, leaving only their clothes and their dentures behind. This sounds nutty enough. All Harold Camping has done is set a date. Does that somehow make him NUTTIER? Not only is the so-called “Rapture” NOT going to occur on May 21st, it isn’t going to occur EVER. And I can promise you this with absolute 100% certainty. There will be no “Rapture,” no “Second Coming,” no “End Of Days.” There most certainly will continue to be wars, plagues, and natural disasters as there have always been, but there won’t be anything supernatural about them. And most importantly there is no such thing as “prophecy” … except for the self-fulfilling kind. In a perverse sort of way, I actually WISH that Harold Camping was right! What an interesting day that would be! What would be even more interesting is if the Apocalypse were to occur in a more spectacular fashion, not in the anthropomorphical sense the authors of the “Left Behind” series have portrayed, but as more of a Stephen Spielberg production, with boiling clouds, trumpets, angels descending out of the sky, Moon turned to blood, the whole nine yards. Imagine coming to the realization that it was all coming true, just as the evangelists had been warning for years, and that there was something more awesome than just the cold, hard, physical reality we inhabit. Imagine actually watching people disappear into thin air! Wouldn’t THAT be something??? Yet in the final analysis, it’s that cold, hard, physical reality that I will content myself with. My life is not so meaningless that I need the fear of a “Rapture” and the “End Times” to make sense of it all … nor do I need Heaven or Hell to bribe me into behaving decently, thank you very much. Since the death of Jesus, people in every generation for over 2,000 years and hundreds of generations have wanted to be the one that experiences the end of days. None has. There must be a clue in there somewhere for you. If you waited at a bus stop for 2,000 years, at what point would you conclude that the bus wasn’t coming? Or would you just stand there … FOREVER … because somebody had stuck up a “bus stop” sign? I told my Brother Sam to say no to Lucifer.